Hajj stampede killed at least 2,121, Associated Press tally indicates. 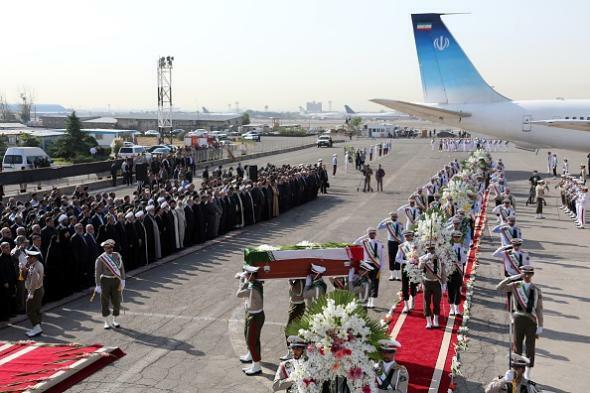 The Iranian honor guard carries the caskets of Iranian pilgrims who were killed in the Sept. 24 stampede during a ceremony upon their arrival on Oct. 3, 2015, in Tehran. The toll keeps rising from the Sept. 24 disaster outside Mecca as individual countries identify bodies and work to determine the whereabouts of hundreds of pilgrims still missing. The official Saudi toll of 769 people killed and 934 injured has not changed since Sept. 26, and officials have yet to address the discrepancy. The incident is thought to be the deadliest ever associated with the annual pilgramage, which has often been the site of stampedes and other mass-fatality events. Iran reports that 465 of its pilgrims were killed, the highest death toll of any country, and its Shiite clerical leadership has been highly critical of the Sunni Saudi royal family for its failure to prevent the stampede. The Sept. 24 disaster took place at the intersection of two roads leading to the Jamarat Bridge, one of the most important sites involved in the hajj and the location of a number of other deadly prior incidents.